Idledale Fire Department (IFD), was formed in 1948 and located in Jefferson County. Idledale Volunteer Fire Department accepted a old pumper from Denver Fire Department and built a shelter to protected the pumper in 1956. The district originally consisted of an area from Bear Creek Canyon near the town of Morrison and west to Kittridge on both sides of the Bear Creek drainage extending northward to Hwy. 40 and west to the El Rancho area. At the time the Genesee development was proposed, an exclusion of the Genesee area took place which created the new Genesee Fire Protection District and left the remaining Idledale District divided. From the fire station in Idledale the District curved to the North and the West all the way to El Rancho. To service the north end of the district, a satellite station (Station 2) was placed on the north end of Grapevine Rd. This provided fire protection for Riva Chase, Cold Springs Ranch, and the Genesee Park area. Idledale Fire District was a member of the Tri-County Volunteer Firemen’s Association. 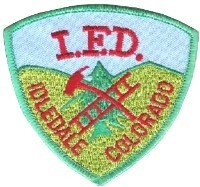 Idledale Fire Protection District was established in 1960. Highland Rescue Team was formed by the department volunteers in 1964. On January 1, 1997 Idledale Fire Protection District with Lookout Mountain Fire Protection District and Mount Vernon Fire Protection District formed the Foothills Fire Protection District.